Panda Express Beats Fundraising Records… AGAIN! Raising $26,744 for BBCH in one year… How do they do it? By simply asking every customer to round-up or make a donation at the register. All of those donations truly do add up to make a difference to the patients and families at BBCH! The next time you’re at the Maine Mall, or you have a craving for their orange chicken, please stop by Panda Express and thank them for their hard work. We are so grateful for their support! 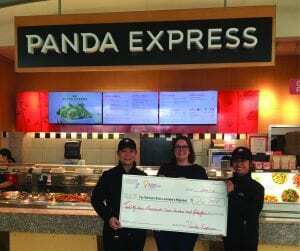 Nationally, Panda Express restaurants raised more than $21 million dollars for local Children’s Miracle Network Hospitals in 2018. And with the beginning of the Chinese New Year on February 5th, this seemed like the perfect time to recognize their accomplishments and thank them for their dedication to helping sick and injured kids. We wish a Happy Chinese New Year to our friends at Panda Express; here’s hoping for a healthy and happy new year for us all! Previous post: Westbrook DQ Continues Reign as “Most Miracle Treat Day Spirit” Champs!